In an enormously detailed alternate universe, a tapestry of historic allusions provides the skeletal structure for Bethesda Game Studio’s phenomenal long-form “Fallout” video game series. Woven into the story are a remarkable number of period-specific references. Such references serve to make game-play interesting, dynamic, and rewarding to the player. In this, the first of many posts, I think that the “Fallout: New Vegas” antagonist, a charismatic villain named Benny, is a decent jumping-off place. Benny, voiced by “Friends” alum Matthew Perry, drives the player character into the surrounding world. Having been shot in the head by Benny and left for dead, the player character survives and begins to explore surrounding communities, hunting down the would-be assassin. The narrative architecture revolves around an alternate history, and “New Vegas” exists in a retro-futuristic depiction of 1950’s Las Vegas, borrowing heavily from the popular culture of 1950’s America. There’s little doubt that the casino chairman, gangster, and smooth-talking Benny is inspired by famed mobster Benjamin “Bugsy” Siegel. 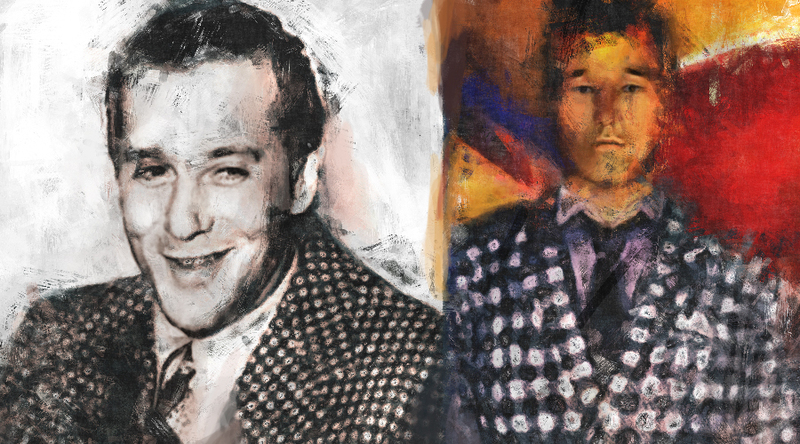 Bugsy Siegel has gone down in history as one of the most feared gangsters in the history of organized crime. Founding member of the infamous “Murder, Inc.” group, he accumulated a significant monetary warchest in the east coast during Prohibition, earning a wage as both a hitman and enforcer. Once Prohibition was repealed in 1933, he turned his attentions to gambling, leaving his native New York in 1936 for the American Southwest. Handsome and charismatic, he aligned himself with developers of the Las Vegas Strip. Desiring a more “legitimate” lifestyle, Siegel relocated to Las Angeles, with a keen eye on a burgeoning adult playground in the Nevada desert. He had initially seen an opportunity to provide illicit services to crewmen working on the Hoover Dam, eventually assisting in the financing of a number of Las Vegas’ original casinos. In his most monumental coup, he eventually took over operations at the Flamingo Hotel in 1945 when its initial developer, William Wilkerson, ran short of funding. Bugsy’s lieutenants, during this time, were tasked with working on a business policy to secure all gambling in Southern California – a venture that never came to fruition. With the Flamingo, Siegel would supply gambling, liquor, and food, and worked to land the biggest entertainers possible at the most reasonable price. He was confident these attractions would lure not only high rollers, but countless vacationers and businessmen. Wilkerson was eventually coerced into selling his shares under threat of death; he went into hiding in Paris soon after. On the night of June 20, 1947, Bugsy Siegel sat with associate Allen Smiley in his girlfriend’s Beverly Hills home. He was reading the Los Angeles Times when an unknown assailant opened fire from outside. The assailant fired at him through the window with a thirty caliber military M1 carbine, striking him multiple times. He was struck twice in the head. Nobody has been charged with the murder, and the crime remains officially unsolved. In “New Vegas,” Benny has similar ambitions. He is revealed to be a character with a ruthless past. He is comfortable with violence, and he has his eyes on ruling the whole of the New Vegas strip. A mobster in Las Vegas, silver-tongued and ambitious, it’s the checkered coat that seals the deal. The world of “Fallout” is populated with detailed references to our history, and this is just one of many, many others. This entry was posted in Gaming and tagged bathesda, bugsy, checkered coat, fallout, fallout 3, fallout 4. new vegas, game, game studios, Gaming, matthew perry, mob, mobster, NCR, new california republic, organized crime, violence. Bookmark the permalink.